There aren’t much of the couples available around that give us true and original meaning couple goals. All of the things that we see about them make us go “aww” and we just wish that we become like them in future. 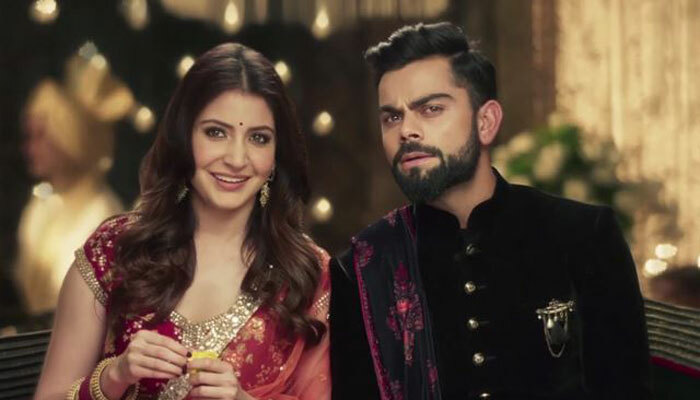 One such couple that has risen quite recently and very prominently is of Virat Kohli and Anushka Sharma. The newlyweds have come a very long way by the looks of the current situation they only have been seen with each other a little more and a little less in this time but for a very long period both have had their ups and downs and all of them have been worth discussing in the entertainment news. It was all because of cricket’s starboy that this started and everyone started noticing. When Virat openly appreciated the work done by the star actress in a movie and the fans literally went gaga because both were on top of their career and it was booming. Thanks to THAT commercial, when both of these met maybe that was the time when they realized a spark was present. Friendship rose and then they both were seen together having lunches and even abroad at times when Virat was on a tour and Anushka just happened to be on the same city for her shooting. Both were reportedly seen in multiple other countries together sometimes her sending the driver for him to pick up and sometimes just casually strolling in the streets. The overall situation of both surprising each other continued and the next gear was shifted slowly as they both started making appearances rather clearly than promoting some hiding behind the curtains. But then it was in that match against Sri Lanka in November 2014, when Virat was generous enough to bring the beats of every heart’s fan to relaxation when he blew a flying kiss towards Anushka, who was among the spectators. However, there’s always a trouble in the paradise isn’t it? It was later in the year 2016 after fighting multiple journalists and answering many times about their relationship that they both thought of focusing on their work and career. By taking a break they did nothing other than realising that living without each other isn’t going to be an easy deal for either one of them. The fans were rather more heartbroken than normal. Despite being away from each other for some time Virat was again showing why he’s the gentlemen off the field because on the field he’s mostly animated and extended further posts and tweets trying to keep everything in loop and then it was finally on December 11, 2017 that the couple decided on forever and that forever took place in Italy, the pictures of the event are still making noise on all of the social media profiles and people are extending their best wishes alongside their prayers to the couple with Virat ready to go back on the field and Anushka? Maybe back to the movies. How it goes, guess we will have to find out.